the central representatives of the ‘pink tide’ running against neoliberalism in Latin America. But just as the pink tide has been fracturing, from internal challenges in some cases and electoral reaction in others, a deep institutional crisis is consuming the PT government of Dilma Rousseff and, indeed, exposing political rot across the state institutions. The opposition forces leading the parliamentary effort of impeachment of Rousseff are also implicated in a range of corruption scandals. The forces of the right, including the far right, have been marshalling street demonstrations of considerable size. Where the political crisis will head next is anything but clear. We present three recent articles about the political crisis in Brazil and the proceedings to impeach president Dilma Rousseff. Brazil’s lower House of Congress on Sunday voted to impeach the country’s president, Dilma Rousseff, sending the removal process to the Senate. In an act of unintended though rich symbolism, the House member who pushed impeachment over the 342-vote threshold was Dep. Bruno Araújo, himself implicated by a document indicating he may have received illegal funds from the construction giant at the heart of the nation’s corruption scandal. Even more significantly, Araújo belongs to the center-right party PSDB, whose nominees have lost four straight national elections to Rousseff’s moderate-left PT party, with the last ballot-box defeat delivered just 18 months ago, when 54 million Brazilians voted to re-elect Dilma as president. 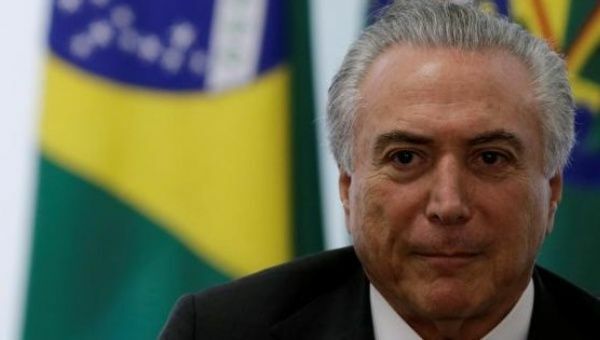 It is highly likely that the Senate will agree to hear the charges, which will result in the 180-day suspension of Dilma as president and the installation of the pro-business Vice President Michel Temer from the PMDB party. The vice president himself is, as the New York Times put it, “under scrutiny over claims that he was involved in an illegal ethanol purchasing scheme.” Temer recently made it known that one of the leading candidates to head his economic team would be the chairman of Goldman Sachs in Brazil, Paulo Leme. If, after trial, two-thirds of the Senate votes to convict, Dilma will be permanently removed. Many suspect that one core objective in impeaching Dilma is to provide a cathartic sense for the public that corruption has been addressed, all designed to exploit Temer’s newfound control to prevent further investigations of the dozens upon dozens of actually corrupt politicians populating the leading parties. That U.S-supported coup and military dictatorship loom large over the current controversy. President Rousseff and her supporters explicitly call the attempt to remove her a coup. One prominent pro-impeachment deputado who is expected to run for president, the right-wing Jair Bolsonaro (whom The Intercept profiled last year), yesterday explicitly praised the military dictatorship and pointedly hailed Col. Carlos Alberto Brilhante Ustra, the dictatorship’s chief torturer (notably responsible for Dilma’s torture). Bolsonaro’s son, Eduardo, also in the House, said he was casting his impeachment vote “for the military men of ’64”: those who carried out the coup and imposed military rule. The endless invocation of God and Family by impeachment proponents yesterday was redolent of the motto of the 1964 coup: “March of the Family with God for Liberty.” Just as Brazil’s leading oligarch-owned media outlets supported the 1964 coup as a necessary strike against left-wing corruption, so too have they been unified in supporting, and inciting, the contemporary impeachment movement against PT with the same rationale. Dilma’s relationship with the U.S. was strained for years, significantly exacerbated by her vocal denunciations of NSA spying that targeted Brazilian industry, its population, and the president personally, as well as Brazil’s close trade relationship with China. Her predecessor, Luiz Inácio Lula da Silva, had also alienated many U.S. officials by, among other things, joining with Turkey to negotiate an independent deal with Iran over its nuclear program when Washington was attempting to assemble global pressure against Tehran. Washington insiders have been making it increasingly clear that they no longer view Brazil as safe for capital. The U.S., of course, has a long – and recent – history of engineering instability and coups against democratically elected, left-wing Latin American governments it dislikes. Beyond the 1964 coup in Brazil, the U.S. was at least supportive of the attempted 2002 overthrow of Venezuelan President Hugo Chávez, played a central role in the 2004 ouster of Haitian President Jean-Bertrand Aristide, and then-Secretary of State Hillary Clinton lent vital support to legitimize the 2009 coup in Honduras, just to name a few examples. Many on the Brazilian left believe that the U.S. is actively engineering the current instability in their country in order to get rid of a left-wing party that has relied heavily on trade with China, and instead usher in a more pro-business, pro-U.S. government that could never win an election on its own. Although no real evidence has emerged proving this theory, a little-publicized trip to the U.S. this week by a key Brazilian opposition leader will likely fuel those concerns. Today – the day after the impeachment vote – Sen. Aloysio Nunes of the PSDB will be in Washington to undertake three days of meetings with various U.S. officials as well as with lobbyists and assorted influence-peddlers close to Clinton and other leading political figures. Sen. Nunes is meeting with the chairman and ranking member of the Senate Foreign Relations Committee, Bob Corker, R-Tenn., and Ben Cardin, D-Md. ; Undersecretary of State and former Ambassador to Brazil Thomas Shannon; and attending a luncheon on Tuesday hosted by the Washington lobbying firm Albright Stonebridge Group, headed by former Clinton Secretary of State Madeleine Albright and former Bush 43 Commerce Secretary and Kellogg Company CEO Carlos Gutierrez. The Brazilian Embassy in Washington and Sen. Nunes’s office told The Intercept that they had no additional information about the Tuesday luncheon. In an email, the Albright Stonebridge Group wrote that there is “no media component” to the event, which is for the “Washington policy and business community,” and a list of attendees or topics addressed would not be made public. Nunes is an extremely important – and revealing – opposition figure to send to the U.S. for these high-level meetings. He ran for vice president in 2014 on the PSDB ticket that lost to Dilma. He will, notably, now be one of the key opposition figures leading the fight to impeach Dilma in the Senate. As president of the Brazilian Senate’s Foreign Relations Committee, Nunes has repeatedly advocated that Brazil once again move closer to an alliance with the U.S. and U.K. And – it almost goes without saying – Nunes has been heavily implicated in corruption allegations; in September, a judge ordered a criminal investigation after an informant, a construction company executive, told investigators that he gave Sen. Nunes R$500,000 ($140,000 U.S.) for his campaign – R$300,000 above board and another R$200,000 in illicit bribes – in order to win contracts with Petrobras. It is hardly the first such accusation against him. Nunes’s Washington trip was reportedly ordered by Temer himself, who is already acting as though he runs Brazil. Temer is furious by what he perceives to be a radical, highly unfavorable change in the international narrative, which has increasingly depicted impeachment as a lawless and anti-democratic attempt by the opposition, led by Temer himself, to gain unearned power. There is no doubt that international opinion has turned against the impeachment movement of Brazil’s opposition parties. Whereas only a month ago Western media outlets depicted anti-government street protests in glowing terms, they now routinely highlight the fact that the legal grounds for impeachment are dubious at best and that impeachment leaders are far more implicated in corruption than Dilma. The trip to Washington by this leading corruption-implicated opposition figure, the day after the House votes to impeach Dilma, will, at the very least, raise questions about the U.S. posture toward removal of the president. It will almost certainly fuel concerns on the Brazilian left about the U.S. role in the instability in their country. And it highlights many of the undiscussed dynamics driving impeachment, including a desire to move Brazil closer to the U.S. and to make it more accommodating to global business interests and austerity measures at the expense of the political agenda that Brazilian voters have embraced in four straight national elections. Glenn Greenwald, Andrew Fishman and David Miranda are journalists for The Intercept , where this article first appeared. Progressive commentators writing in English are covering a lot of the important aspects of the current crisis, but a couple of key points are consistently missing. Politics in Brazil is being divided between supporters of the workers party and ‘coxinhas’ (a breaded chicken snack) who are conservatives in an incredibly rigid way: so rigid in fact that it no longer reflects reality. The Brazilian national media is terrible and feeds the division openly and shamelessly campaigning for the right. In fact, it is less campaign for the right and more anti PT campaigns in daily newspapers, magazines and television. The short version is that right lost the elections again in 2014. They lost narrowly. But following those elections, president Dilma ended up entirely dependent on alliances with right-wing parties who are the majority both in Congress and in the Senate. To date, the right did not accept that they lost the election. They began actively campaigning for impeachment the day after the election – before even deciding what kind of evidence they would try to arrange. Since the election, the price of oil has fallen, the U.S. dollar’s value rose and the value of the Real – the Brazilian currency has fallen, all of which produced immediate economic effects. All of the associated economic problems are being attributed personally to Dilma by the media. Every single day this message is repeated. We export a lot of oil in Canada as well. Thus, the exchange rate is linked to the price of oil. Changes in international oil prices have an immediate effect on the exchange rate and on the Canadian economy. Imagine the media blaming the Prime Minister (personally!) for this 24 hours a day. The right is doing its best to destabilize the current government while simultaneously, the media repeats the message that Dilma is weak and unprepared and that she continues to be personally responsible for the reduction of economic growth (in Brazilian politics everything is personal, nothing is institutional or structural). How a woman that fought against dictatorship, was arrested and tortured, and then managed to climb to the position of president in this extremely macho, patriarchal system a as ‘weak’ is really impossible to understand. Of course there are always diverse motives that take people into the streets. And naturally, a diversity of banners that people make to share their messages. Some are genuinely shocking – like ‘why didn’t we kill them all in 64’ (an explicit reference to the time when the military seized power and killed trade unionists among many others), ‘End Democracy, Military Intervention Now!’, most recently, most recently ‘End Islamisization of Brazil’, banners have appeared in two different Brazilian cities. This message really has absolutely nothing to do with the current situation, but does strongly suggest the involvement of international fascist groups. For the millions participating in the demonstrations of the ‘right’, the statistics are clear: more than 70% are white – in a country where national statistics indicate that more than 50% of the population is black. More than 70% receive more than five times the minimum wage (in the top 5% of earners in this country). Clearly, they have a class position that they will defend. Critical and intelligent Brazilian analysts have identified that these people have privileges and are committed to fight to defend them. This has nothing to do with rights. Rights are for everyone. The issue here is defend privileges and thus, inequality. Everyone knows someone who participated in these demonstrations. I consistently ask two things that I think are important in order to explore and understand the underlying logic of these protesters. 1. Do they know that there is a legal campaign for impeachment? After confirmation, I ask if it is important to allow the legal process to run until its conclusion or if we should force Rousseff out regardless of that process and have elections tomorrow. ‘Forget the legal process’ is the most common answer. They do not care about the legal process or the rule of law. 2. Who is organizing the demonstrations? Again, the replies are consistent: ‘I don’t know and don’t care who’s doing the organizing!’ There are four main groups, all of which have seriously wealthy people funding them. The famous Koch brothers from the U.S. included. One of the groups openly campaigns for the return of military dictatorship. Another says clearly that they learned a lot from the ‘MovimentoPasseLivre’ a decentralized group of engaged young people that organized the 2013 demonstrations here in Brazil; a group which, by the way, is genuinely left and continues to do a great job in the community, discussing, debating, organizing in a deeply democratic way – all of which has absolutely nothing to do with any of the organizers of current demonstrations). They used the tactic of ‘PasseLivre’ of not having clear leaders with decision making power or party affiliation in order to hide the powerful leaders behind them, because their leaders have very little support at the base of the population. The economic crisis is being used at this particular time with the 2018 national elections in mind. The biggest worry is Lula’s return. It is an entirely valid concern. Lula has an amazing base of support, particularly in the poorest regions of the country. Although the protesters were white, educated (but ignorant – high levels of formal education, but do not want to hear about ‘facts’) and the rich defending their class position (saying things like “Out with the PT so the currency goes up and we can go back to Miami to go shopping” in their Facebook groups), many others taking part in the huge demonstrations do not support the return of military dictatorship or this clear defense of the elite and their specific interests. Many of these demonstrators are very frustrated because they supported the political and social project of the PT. The PT was coming in from the outside of this political system that so many feel is so rotten. The PT won power nationally promising to end systemic corruption. It hasn’t ended. Of course, much of the corruption was not personal enrichment (although this also exists), but buying votes to stay in power. This does not make any difference at all for most voters. Feelings on the streets are similar to that pervasive, deep level of disappointment in South Africa when the harsh policies of neoliberalism arrived. What a disappointment when hopes are sold and things get worse rather than improve after so much struggle. For now, we remain in this unstable situation, which clearly corrupt politicians retain the power to decide the impeachment of a democratically elected president and then take power themselves. At least one third of the members of the special commission that will examine impeachment are currently under investigation for criminal charges in the Supreme Court, including corruption, money laundering and electoral crimes. Euan Gibb is a graduate of the Global Labour University and the Labour Studies programme at McMaster University. He is a trade union activist that has worked with various unions as a researcher and organizer. This article first appeared on Brasil Debate website. Brazil is experiencing a profound institutional crisis, the biggest since the end of the dictatorship. The Rousseff government is seriously damaged, leading to its paralysis, but so are the principal institutions of bourgeois democracy. The main leaders in Parliament are involved in Operation Lava Jato, including Eduardo Cunha, president of the Chamber of Deputies, as one of the defendants in the trial. The leaders of the traditional parties, those who are part of the government as well as those in the right wing opposition (including the PMDB, the party of Cunha and Vice President Michel Temer, which recently withdrew from the government) are under investigation. Such a situation is contributing to produce great chaos in the institutions, with a judiciary divided at all levels. To this is added an intense crisis of credibility of the traditional institutions and of the modus operandi of bourgeois democracy, of which the first signs were expressed in the streets in 2013. Brazil is therefore experiencing a full-scale political crisis, on top of the serious economic, social and environmental crisis. This is resulting in growing unemployment, inflation, a wage freeze, the collapse of public services and the disasters and crimes against the environment, symbolizing the failure of a development model. The exhaustion of the model of ‘growth’, adopted during the Lula ‘periods’, with now the implementation of a policy of neoliberal adjustment and recession, has produced a scenario of long-term stagnation. Whatever the outcome in the short term, an accumulation of medium-term crises can be expected to continue, bringing with it social and political tensions. The possibilities of maintaining the export-based ‘neo-extrativista’ model of growth are becoming exhausted. Even if there is political survival through the recent polarization between the two camps in the institutional war, the strategy established by Lulaism, which consisted of encouraging entrepreneurs, agribusiness and financial capital and, simultaneously, making some concessions to the poorest layers, no longer has any political and ethical possibility of appearing as a shift to the left. Even after putting more than 100,000 people in the streets of Sao Paulo, Lula continues to encourage the representatives of capital to trust him to be the guarantor of the social pact. In this context, he is reediting, in more humiliating terms, the “Letter to the Brazilian People” of 2002. This is the end of a long cycle of the Brazilian left. In the midst of the political polarization that has developed during the two years of the Dilma government, in Brazilian society right-wing ideas and sentiments are developing, with a will to impose criminal punishment and the search for a Saviour, in other words a Bonaparte, capable of stopping corruption. The anti-petismo spectrum is divided into two parts: one more liberal and the other more conservative, with many points of intersection between them. Some movements of a liberal character, such as the Free Brazil Movement (MBL) and “Come and Demonstrate” (Vem Para Rua) and other more reactionary ones, including some religious leaders and some advocates of a return to military dictatorship, such as Bolsonaro, have seen their ability to exert influence grow. In this context, violent attitudes and hate-filled speeches have been made against the left in general. Furthermore, the media is playing a role of incitement to hatred and of manipulation of information, sometimes directly or indirectly contributing to more or less serious episodes of violence. The crisis of the old left in power, which has implemented unpopular and repressive policies (particularly in the big urban peripheries, against young people and blacks), and the offensive of the intolerant right and its incitement to hatred, rebound against left-wing and socialist ideas as a whole. There must be the opening of a period of reorganization of the mass movement and the possibility of a new cycle for the reconstruction of a left project. Young people are today experiencing the reality of unemployment, violence, of the lack of public services and democratic rights. Moreover, they identify with neither of the two main poles that are at war today, which explains their low participation in the mobilizations in March. We should also note the presence of more progressive sectors of society and of the ‘working-class bases’ of the former historic bloc, who demonstrated massively to defend democratic freedoms, with many criticisms of the government, either because of its unpopular economic policies or because of obvious corruption. The present scenario in Brazil is very difficult to manage for the anti-capitalist and socialist left. A government that came from the working-class and people’s movement is in the process of being overthrown by the right, whose principal agents are the judiciary, the opposition in Parliament and the media, orchestrated by the Globe Group, which is hegemonic there. This government, in free fall, is not a progressive government, but a government that is implementing a neoliberal adjustment policy and which, when it is under pressure, moves further to the right: the anti-terrorist law, the announcement of wage cuts, attacks on civil servants and pension reform, the perspective of suspending adjustments to the minimum wage. Despite the measures clearly favouring the interests of capital, the employers’ organizations, the representatives of finance and of the media are in agreement on the inability of Dilma Rousseff to implement the adjustment plans so as to ensure their stability. They therefore consider it necessary to replace her. The massive mobilizations on March 13 (for the destitution of Dilma), and on March 18 and 31 (against the destitution of Dilma) were quite heterogeneous in different cities and regions. The last one, involving some 700,000 people throughout the country, witnessed demonstrations that were globally against the destitution of Dilma, for democracy and against the anti-social policies of the government. Nevertheless, a large majority of the population is for the departure of the president and the government has lost its majority popular base. The possibility of a new coup d’état, as in 1964, is not on the agenda. Nevertheless, the weight of religious fundamentalist institutions, the influence of oligarchic sectors, as well as of sectors related to the arms industry and the various police forces, are defending retrograde projects and trying to liquidate past gains. At the beginning of the investigations into corruption, businessmen and right-wing personalities, belonging to the government or not, were imprisoned. But the prolonged institutional crisis has created an atmosphere where everything-is-permitted, thanks to Operation Lava Jato, by aberrant and undemocratic judicial operations against those accused who are identified with the government; this is coordinated with all the major media and the right-wing opposition. The general indignation against corruption and the PT is helping the majority of the forces representing capital to work for a change of government without any democratic change in the political regime. The period that has opened up presents a difficult transition because of the absence of a socialist left with sufficient influence to become the protagonist of an alternative to the crisis. The Socialism and Liberty Party (PSOL) is respected in social struggles, intervenes in sectors of youth and of various sectors of the oppressed and gathers several million votes in elections. It is the main party of the socialist left. However, it is not yet able to present a real alternative to the crisis, even though it situates itself as a left opposition, against the government’s concessions to capital, against the privileges of the ruling class, against corruption. And it is clear that it absolutely does not defend the manoeuvres of the right to bring down Rousseff. In fact, the impeachment process of the President by Parliament is led by its president, who is himself implicated in the investigations into Petrobras and in a series of crimes. At the same time, many efforts are being made (by the media and the judiciary) not to highlight the involvement of personalities of the right opposition in Operation Lava Jato, including members of the Party of the Brazilian Democratic Movement (PMDB), which has just left the government and of which Temer, the Vice-President, is a member. If the impeachment of Dilma proceeded through ‘normal’ or legal channels, it would be necessary to prevent Temer from taking over the leadership of the country. Moreover, even some of the mainstream media, which are now, generally speaking, in the anti-PT camp, say that Temer has no support to govern. They demand the destitution of both Dilma and Temer. Polls say that if elections were held today, Temer would only get one per cent of the vote. The way out of such a crisis lies in calling presidential and legislative elections. João Machado is a member of the leadership of PSOL and of the Insurgencía current within it that groups the members of the Fourth International. Bea Whitaker is a member of the Fourth International in Ensemble!, France. This article first appeared on the International Viewpoint website. This article was written before the impeachment vote on Sunday 17 April. Operation Lava Jato is a criminal investigation into embezzlement and money-laundering involving Petrobras (a Brazilian firm linked to the oil industry), involving very important entrepreneurs and politicians. In 2013, a huge wave of strikes, spontaneous mobilizations of youth and various revolts spread across the country. Alfredo Saad Filho, “Overthrowing Dilma Rousseff,” The Bullet No. 1237, March 23, 2016. Alfredo Saad Filho, “The Mass Protests in Brazil in June-July 2013,” The Bullet No. 851, July 15, 2013. 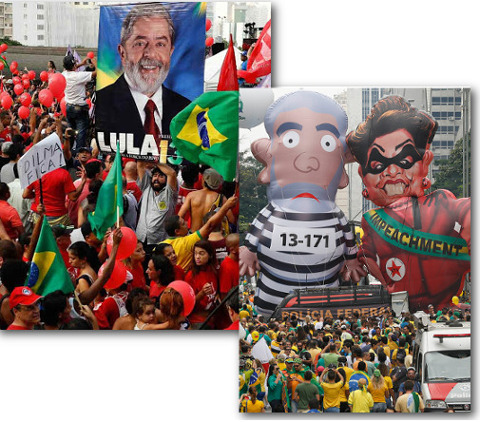 Carlos Vainer, “Mega-Events, Mega-Businesses, Mega-Protests in Brazil,” The Bullet No. 859, August 6, 2013. Manuel Larrabure, “‘Não Nos Representam!’ A Left Beyond the Workers Party?,” The Bullet No. 853, July 18, 2013. Euan Gibb, “Brazil: Private Transit, Public Protests,” The Bullet No. 841, June 26, 2013. Glenn Greenwald is a journalist for The Intercept . 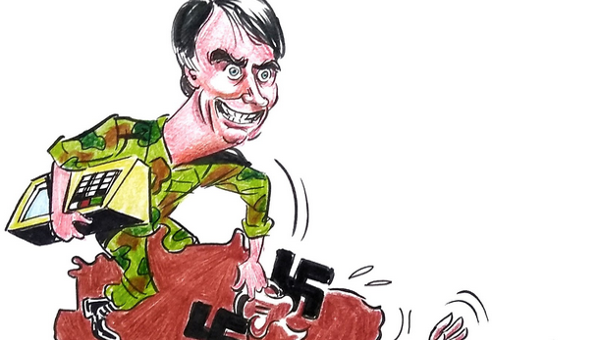 Brazil: Fascism on the Verge of Power?